In the 18th century, observations made of all the known planets (Mercury, Venus, Earth, Mars, Jupiter and Saturn) led astronomers to discern a pattern in their orbits. Eventually, this led to the Titius–Bode law, which predicted the amount of space between the planets. In accordance with this law, there appeared to be a discernible gap between the orbits of Mars and Jupiter, and investigation into it led to a major discovery. Eventually, astronomers realized that this region was pervaded by countless smaller bodies which they named “asteroids”. This in turn led to the term “Asteroid Belt”, which has since entered into common usage. Like all the planets in our Solar System, it orbits our Sun, and has played an important role in the evolution and history of our Solar System. The Asteroid Belt consists of several large bodies, along with millions of smaller size. The larger bodies, such as Ceres, Vesta, Pallas, and Hygiea, account for half of the belt’s total mass, with almost one-third accounted for by Ceres alone. Beyond that, over 200 asteroids that are larger than 100 km in diameter, and 0.7–1.7 million asteroids with a diameter of 1 km or more. It total, the Asteroid Belt’s mass is estimated to be 2.8×1021 to 3.2×1021 kilograms – which is equivalent to about 4% of the Moon’s mass. While most asteroids are composed of rock, a small portion of them contain metls such as iron and nickel. The remaining asteroids are made up of a mix of these, along with carbon-rich materials. Some of the more distant asteroids tend to contain more ices and volatiles, which includes water ice. Despite the impressive number of objects contained within the belt, the Main Belt’s asteroids are also spread over a very large volume of space. As a result, the average distance between objects is roughly 965,600 km (600,000 miles), meaning that the Main Belt consists largely of empty space. In fact, due to the low density of materials within the Belt, the odds of a probe running into an asteroid are now estimated at less than one in a billion. The main (or core) population of the asteroid belt is sometimes divided into three zones, which are based on what is known as “Kirkwood gaps”. Named after Daniel Kirkwood, who announced in 1866 the discovery of gaps in the distance of asteroids, these gaps are similar to what is seen with Saturn’s and other gas giants’ systems of rings. Originally, the Asteroid Belt was thought to be the remnants of a much larger planet that occupied the region between the orbits of Mars and Jupiter. This theory was originally suggested by Heinrich Olbders to William Herschel as a possible explanation for the existence of Ceres and Pallas. However, this hypothesis has since been shown to have several flaws. For one, the amount of energy required to destroy a planet would have been staggering, and no scenario has been suggested that could account for such events. Second, there is the fact that the mass of the Asteroid Belt is only 4% that of the Moon (and 22% that of Pluto). The odds of a cataclysmic collision with such a tiny body are very unlikely. Lastly, the significant chemical differences between the asteroids do no point towards a common origin. Today, the scientific consensus is that, rather than fragmenting from an original planet, the asteroids are remnants from the early Solar System that never formed a planet at all. During the first few million years of the Solar System’s history, gravitational accretion caused clumps of matter to form out of an accretion disc. These clumps gradually came together, eventually undergoing hydrostatic equilibrium (become spherical) and forming planets. However, within the region of the Asteroid Belt, planestesimals were too strongly perturbed by Jupiter’s gravity to form a planet. As such, these objects would continue to orbit the Sun as they had before, with only one object (Ceres) having accumulated enough mass to undergo hydrostatic equilibrium. On occasion, they would collide to produce smaller fragments and dust. The asteroids also melted to some degree during this time, allowing elements within them to be partially or completely differentiated by mass. However, this period would have been necessarily brief due to their relatively small size. It likely ended about 4.5 billion years ago, a few tens of millions of years after the Solar System’s formation. Though they are dated to the early history of the Solar System, the asteroids (as they are today) are not samples of its primordial self. They have undergone considerable evolution since their formation, including internal heating, surface melting from impacts, space weathering from radiation, and bombardment by micrometeorites. Hence, the Asteroid Belt today is believed to contain only a small fraction of the mass of the primordial belt. Computer simulations suggest that the original asteroid belt may have contained mass equivalent to the Earth. Primarily because of gravitational perturbations, most of the material was ejected from the belt a million years after its formation, leaving behind less than 0.1% of the original mass. Since then, the size distribution of the asteroid belt is believed to have remained relatively stable. When the asteroid belt was first formed, the temperatures at a distance of 2.7 AU from the Sun formed a “snow line” below the freezing point of water. Essentially, planetesimals formed beyond this radius were able to accumulate ice, some of which may have provided a water source of Earth’s oceans (even more so than comets). Located between Mars and Jupiter, the belt ranges in distance between 2.2 and 3.2 astronomical units (AU) from the Sun – 329 million to 478.7 million km (204.43 million to 297.45 million mi). It is also an estimated to be 1 AU thick (149.6 million km, or 93 million mi), meaning that it occupies the same amount of distance as what lies between the Earth to the Sun. The distance of an asteroid from the Sun (its semi-major axis) depends upon its distribution into one of three different zones based on the Belt’s “Kirkwood Gaps”. Zone I lies between the 4:1 resonance and 3:1 resonance Kirkwood gaps, which are roughly 2.06 and 2.5 AUs (3 to 3.74 billion km; 1.86 to 2.3 billion mi) from the Sun, respectively. Zone II continues from the end of Zone I out to the 5:2 resonance gap, which is 2.82 AU (4.22 billion km; 2.6 mi) from the Sun. Zone III, the outermost section of the Belt, extends from the outer edge of Zone II to the 2:1 resonance gap, located some 3.28 AU (4.9 billion km; 3 billion mi) from the Sun. While many spacecraft have been to the Asteroid Belt, most were passing through on their way to the outer Solar System. Only in recent years, with the Dawn mission, that the Asteroid Belt has been a focal point of scientific research. In the coming decades, we may find ourselves sending spaceships there to mine asteroids, harvest minerals and ices for use here on Earth. 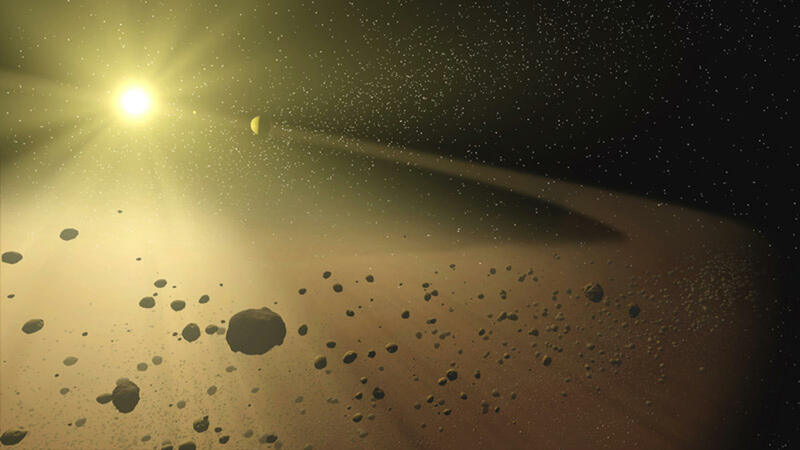 We’ve written many articles about the Asteroid Belt here at Universe Today. Here’s What is the Asteroid Belt?, How Long Does it Take to get to the Asteroid Belt?, How Far is the Asteroid Belt from Earth?, Why Isn’t the Asteroid Belt a Planet?, and Why the Asteroid Belt Doesn’t Threaten Spacecraft. To learn more, check out NASA’s Lunar and Planetary Science Page on asteroids, and the Hubblesite’s News Releases about Asteroids. Astronomy Cast also some interesting episodes about asteroids, like Episode 55: The Asteroid Belt and Episode 29: Asteroids Make Bad Neighbors. Between the orbits of Mars and Jupiter lies the Solar System’s Main Asteroid Belt. Consisting of millions of objects that range in size from hundreds of kilometers in diameter (like Ceres and Vesta) to one kilometer or more, the Asteroid Belt has long been a source of fascination for astronomers. Initially, they wondered why the many objects that make it up did not come together to form a planet. 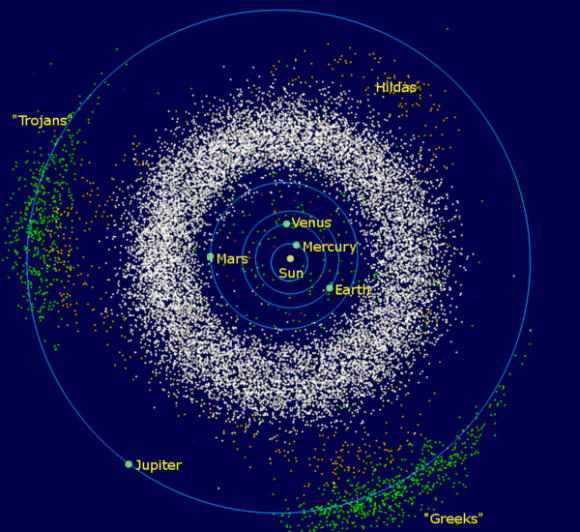 But more recently, human beings have been eyeing the Asteroid Belt for other purposes. Whereas most of our efforts are focused on research – in the hopes of shedding additional light on the history of the Solar System – others are looking to tap for its considerable wealth. With enough resources to last us indefinitely, there are many who want to begin mining it as soon as possible. Because of this, knowing exactly how long it would take for spaceships to get there and back is becoming a priority. The distance between the Asteroid Belt and Earth varies considerably depending on where we measure to. Based on its average distance from the Sun, the distance between Earth and the edge of the Belt that is closest to it can be said to be between 1.2 to 2.2 AUs, or 179.5 and 329 million km (111.5 and 204.43 million mi). However, at any given time, part of the Asteroid Belt will be on the opposite side of the Sun, relative to Earth. From this vantage point, the distance between Earth and the Asteroid Blt ranges from 3.2 and 4.2 AU – 478.7 to 628.3 million km (297.45 to 390.4 million mi). To put that in perspective, the distance between Earth and the Asteroid Belt ranges between being slightly more than the distance between the Earth and the Sun (1 AU), to being the same as the distance between Earth and Jupiter (4.2 AU) when they are at their closest. But of course, for reasons of fuel economy and time, asteroid miners and exploration missions are not about to take the long way! As such, we can safely assume that the distance between Earth and the Asteroid Belt when they are at their closest is the only measurement worth considering. The Asteroid Belt is so thinly populated that several unmanned spacecraft have been able to move through it on their way to the outer Solar System. In more recent years, missions to study larger Asteroid Belt objects have also used this to their advantage, navigating between the smaller objects to rendezvous with bodies like Ceres and Vesta. In fact, due to the low density of materials within the Belt, the odds of a probe running into an asteroid are now estimated at less than one in a billion. The first spacecraft to make a journey through the asteroid belt was the Pioneer 10 spacecraft, which entered the region on July 16th, 1972 (a journey of 135 days). As part of its mission to Jupiter, the craft successfully navigated through the Belt and conducted a flyby of Jupiter (in December of 1973) before becoming the first spacecraft to achieve escape velocity from the Solar System. An artist’s illustration of NASA’s Dawn spacecraft approaching Ceres. Image: NASA/JPL-Caltech. At the time, there were concerns that the debris would pose a hazard to the Pioneer 10 space probe. But since that mission, 11 additional spacecraft have passed through the Asteroid Belt without incident. These included Pioneer 11, Voyager 1 and 2, Ulysses, Galileo, NEAR, Cassini, Stardust, New Horizons, the ESA’s Rosetta, and most recently, the Dawn spacecraft. For the most part, these missions were part of missions to the outer Solar System, where opportunities to photograph and study asteroids were brief. Only the Dawn, NEAR and JAXA’s Hayabusa missions have studied asteroids for a protracted period in orbit and at the surface. Dawn explored Vesta from July 2011 to September 2012, and is currently orbiting Ceres (and sending back gravity data on the dwarf planet’s gravity) and is expected to remain there until 2017. The fastest mission humanity has ever mounted was the New Horizons mission, which was launched from Earth on Jan. 19th, 2006. The mission began with a speedy launch aboard an Atlas V rocket, which accelerated it to a a speed of about 16.26 km per second (58,536 km/h; 36,373 mph). At this speed, the probe reached the Asteroid Belt by the following summer, and made a close approach to the tiny asteroid 132524 APL by June 13th, 2006 (145 days after launching). However, even this pales in comparison to Voyager 1, which was launched on Sept. 5th, 1977 and reached the Asteroid Belt on Dec. 10th, 1977 – a total of 96 days. And then there was the Voyager 2 probe, which launched 15 days after Voyager 1 (on Sept. 20th), but still managed to arrive on the same date – which works out to a total travel time of 81 days. Not bad as travel times go. At these speed, a spacecraft could make the trip to the Asteroid Belt, spend several weeks conducting research (or extracting ore), and then make it home in just over six months time. However, one has to take into account that in all these cases, the mission teams did not decelerate the probes to make a rendezvous with any asteroids. Ergo, a mission to the Asteroid Belt would take longer as the craft would have to slow down to achieve orbital velocity. And they would also need some powerful engines of their own in order to make the trip home. This would drastically alter the size and weight of the spacecraft, which would inevitably mean it would be bigger, slower and a heck of a lot more expensive than anything we’ve sent so far. Another possibility would be to use ionic propulsion (which is much more fuel efficient) and pick up a gravity assist by conducting a flyby of Mars – which is precisely what the Dawn mission did. However, even with a boost from Mars’ gravity, the Dawn mission still took over three years to reach the asteroid Vesta – launching on Sept. 27th, 2007, and arriving on July 16th, 2011, (a total of 3 years, 9 months, and 19 days). Not exactly good turnaround! A number of possibilities exist that could drastically reduce both travel time and fuel consumption to the Asteroid Belt, many of which are currently being considered for a number of different mission proposals. One possibility is to use spacecraft equipped with nuclear engines, a concept which NASA has been exploring for decades. In a Nuclear Thermal Propulsion (NTP) rocket, uranium or deuterium reactions are used to heat liquid hydrogen inside a reactor, turning it into ionized hydrogen gas (plasma), which is then channeled through a rocket nozzle to generate thrust. A Nuclear Electric Propulsion (NEP) rocket involves the same basic reactor converting its heat and energy into electrical energy, which would then power an electrical engine. In both cases, the rocket would rely on nuclear fission or fusion to generates propulsion rather than chemical propellants, which has been the mainstay of NASA and all other space agencies to date. According to NASA estimates, the most sophisticated NTP concept would have a maximum specific impulse of 5000 seconds (50 kN·s/kg). Using this engine, NASA scientists estimate that it would take a spaceship only 90 days to get to Mars when the planet was at “opposition” – i.e. as close as 55,000,000 km from Earth. Adjusted for a distance of 1.2 AUs, that means that a ship equipped with a NTP/NEC propulsion system could make the trip in about 293 days (about nine months and three weeks). A little slow, but not bad considering the technology exists. Another proposed method of interstellar travel comes in the form of the Radio Frequency (RF) Resonant Cavity Thruster, also known as the EM Drive. Originally proposed in 2001 by Roger K. Shawyer, a UK scientist who started Satellite Propulsion Research Ltd (SPR) to bring it to fruition, this drive is built around the idea that electromagnetic microwave cavities can allow for the direct conversion of electrical energy to thrust. According to calculations based on the NASA prototype (which yielded a power estimate of 0.4 N/kilowatt), a spacecraft equipped with the EM drive could make the trip to Mars in just ten days. Adjusted for a trip to the Asteroid Belt, so a spacecraft equipped with an EM drive would take an estimated 32.5 days to reach the Asteroid Belt. Impressive, yes? But of course, that is based on a concept that has yet to be proven. So let’s turn to yet another radical proposal, which is to use ships equipped with an antimatter engine. Created in particle accelerators, antimatter is the most dense fuel you could possibly use. When atoms of matter meet atoms of antimatter, they annihilate each other, releasing an incredible amount of energy in the process. According to the NASA Institute for Advanced Concepts (NIAC), which is researching the technology, it would take just 10 milligrams of antimatter to propel a human mission to Mars in 45 days. Based on this estimate, a craft equipped with an antimatter engine and roughly twice as much fuel could make the trip to the Asteroid Belt in roughly 147 days. But of course, the sheer cost of creating antimatter – combined with the fact that an engine based on these principles is still theoretical at this point – makes it a distant prospect. Basically, getting to the Asteroid Belt takes quite a bit of time, at least when it comes to the concepts we currently have available. Using theoretical propulsion concepts, we are able to cut down on the travel time, but it will take some time (and lots of money) before those concepts are a reality. However, compared to many other proposed missions – such as to Europa and Enceladus – the travel time is shorter, and the dividends quite clear. As already stated, there are enough resources – in the form of minerals and volatiles – in the Asteroid Belt to last us indefinitely. And, should we someday find a way to cost-effective way to send spacecraft there rapidly, we could tap that wealth and begin to usher in an age of post-scarcity! But as with so many other proposals and mission concepts, it looks like we’ll have to wait for the time being. We have written many articles about the asteroid belt for Universe Today. Here’s Where Do Asteroids Come From?, Why the Asteroid Belt Doesn’t Threaten Spacecraft, and Why isn’t the Asteroid Belt a Planet?. Also, be sure to learn which is the Largest Asteroid in the Solar System, and about the asteroid named after Leonard Nimoy. And here’s 10 Interesting Facts about Asteroids. We also have many interesting articles about the Dawn spacecraft’s mission to Vesta and Ceres, and asteroid mining. In the 18th century, observations made of all the known planets (Mercury, Venus, Earth, Mars, Jupiter and Saturn) led astronomers to the realization that there was a pattern in their orbits. Eventually, this led to the Titius–Bode law, which predicted the amount of space that naturally existed between each celestial body that orbited our Sun. In accordance with this law, astronomers noted that there appeared to be a discernible gap between the orbits of Mars and Jupiter. Investigations into this gap eventually resulted in astronomers observing several bodies of various size. This led to the creation of the term “asteroid” (Greek for ‘star-like’ or ‘star-shaped’), as well as “Asteroid Belt”, once it became clear just how many there were. Through various methods, astronomers have since confirmed the existence of several million objects between the orbit of Mars and Jupiter. They have also determined, with a certain degree of accuracy, how far it is from our planet. The Asteroid Belt consists of several large bodies, coupled with millions of smaller size. 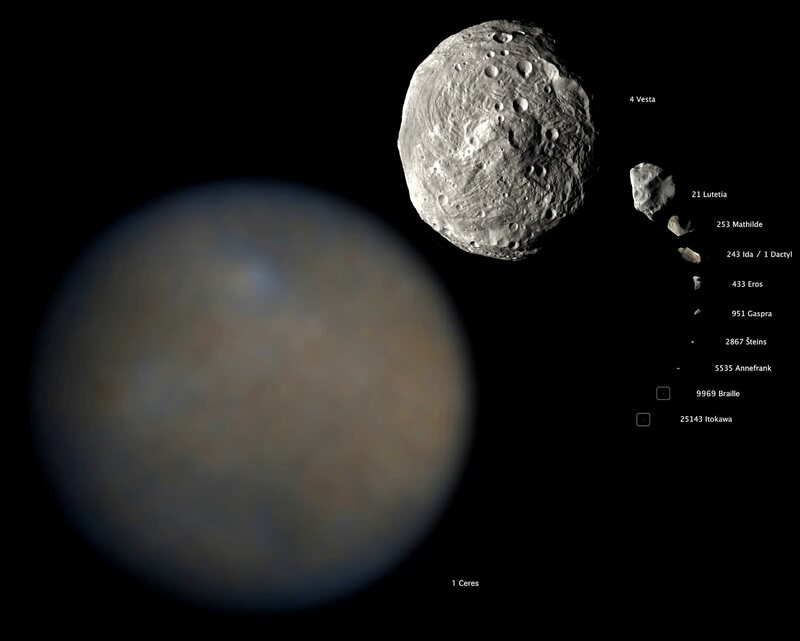 The larger bodies, such as Ceres, Vesta, Pallas, and Hygiea, account for half of the belt’s total mass, with almost one-third accounted for by Ceres alone. Beyond that, over 200 asteroids that are larger than 100 km in diameter, and 0.7–1.7 million asteroids with a diameter of 1 km or more. It total, the Asteroid Belt’s mass is estimated to be 2.8×1021 to 3.2×1021 kilograms – which is equivalent to about 4% of the Moon’s mass. While most asteroids are composed of rock, a small portion of them contain metals such as iron and nickel. The remaining asteroids are made up of a mix of these, along with carbon-rich materials. Some of the more distant asteroids tend to contain more ices and volatiles, which includes water ice. Located between Mars and Jupiter, the belt ranges in distance between 2.2 and 3.2 astronomical units (AU) from the Sun – 329 million to 478.7 million km (204.43 million to 297.45 million mi). It is also an estimated 1 AU thick (149.6 million km, or 93 million mi), meaning that it occupies the same amount of distance as what lies between the Earth to the Sun. The distance between the Asteroid Belt and Earth varies considerably depending on where we measure to. Based on its average distance from the Sun, the distance between Earth and the closest edge of the Belt can be said to be between 1.2 to 2.2 AUs, or 179.5 and 329 million km (111.5 and 204.43 million mi). But of course, at any given time, part of the Asteroid Belt will be on the opposite side of the Sun relative to us as well. From this vantage point, the distance between Earth and the Asteroid Belt ranges from 3.2 and 4.2 AU – 478.7 to 628.3 million km (297.45 to 390.4 million mi). To put that in perspective, the distance between Earth and the Asteroid Belt ranges from being slightly more than the distance between the Earth and the Sun (1 AU), to being the same as the distance between Earth and Jupiter (4.2 AU) when they are at their closest. Naturally, any exploration or other kind of mission launched from Earth is going to take the shortest route, unless it is aiming for a specific asteroid. And even then, mission planners will time the launch to ensure that we are closest to the destination. Hence, we can safely use the estimates of 1.2 – 2.2 AU to gauge the distance between us and the Main Belt. Even so, at its closest, getting to the Asteroid Belt would involve a bit of a hike! In short, it is approximately 179.5 million km (or 111.5 million mi) distant from us at any given time. As such, knowing just how much time and energy it would take to get their and back is going to come in handy if and when we begin mounting crewed missions to the Belt, not to mention the prospect of asteroid mining! We have written many interesting articles on the Asteroid Belt here at Universe Today. Here’s What is the Asteroid Belt?, Where Do Asteroids Come From?, Why the Asteroid Belt Doesn’t Threaten Spacecraft, Why isn’t the Asteroid Belt a Planet?, and 10 Interesting Facts about Asteroids.